Kumquats, silly name and all, are a wonderful little fruit. Shaped like a grape but tastes like an inside-out orange/clementine with a sweet rind and a sour, tannic, semi-pithy interior. One of my personal favorite things to bring on a road trip for sure! These little fellows are also quite versatile when it comes to culinary adventuring. From marinades to ice creams (pasteurized juice) you can always add a more complex orangey flavor for a spin on classic recipes. This recipe is one of my all time favorite ways to use them and I think it really makes them shine as an accent to many both sweet and savory dishes! Start by popping out the little green stems, either by hand or the edge of a paring knife then slicing them length-wise and cutting out the seeds. These seeds are, like any citrus seeds, quite bitter and can lend that same tannic, bitter mouth feel/flavor to the final product if you don't get them all. Don't worry if the fruit gets a bit rough looking in the process of seeding. It will plump up in the process of blanching and candying and they will return to their nice, rounded, grape-shape. Once you've got all the fruit prepped for candying, we've got to blanch them to reduce the bitter (tannic) mouth-feel, bring out certain sugars and bring up colors to prevent dulling while cooking. To blanch your fruit properly, toss them in a pot and add just enough cold water to cover. Bring to a good boil for about 30 seconds then drain. Repeat this process two more times then rinse quickly and set aside. Lets take one molecule involved in color of almost all vegetables and its foil: Chlorophyll and Chlorophyllase. 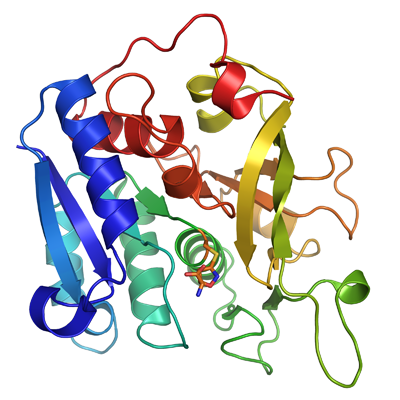 Chlorophyllase is an enzyme common in fruits and vegetables that acts to reshape the Chlorophyll molecule in a way that makes it water soluble. In this state, chlorophyll can be more easily affected by pH extremes that dull color or simply be dispersed into the cooking liquid. In blanching we both wash out certain macromolecules and acids at the same time Denaturing the Chlorophyllase (destroying its functionality) via the boiling heat. So there we have food trial-by-fire so to speak... Blanching = heat + water = inactivation/removal via liquid of negatively influential protein macro-molecules = nice, pretty colors, scents, flavors, vitamin profiles in long-term stored food. SCIENCY! Now that we've finished prepping and blanching let's make the syrup for candying. If you are going to use a vanilla bean, slice the bean length wise and scrape the seeds with the trailing edge of your knife. Toss the seeds and the pod into the pot along with sugar, water, rum, and honey and bring to a boil over medium high heat. Boil, stirring occasionally to break up sugar lumps, until the liquid becomes clear then remove and discard the vanilla pod. Bring your hot syrup to a rolling boil, add the blanched fruit, then turn heat down to a slow boil. Drain your fruit with a mesh strainer into a heat proof container and conserve all that lovely syrup for later use. The wonderful byproduct of this recipe is vanilla kumquat simple syrup which of course can be used for all kinds of things from cake moistener to liquid sugar for sweet teas! The fruit itself can be canned via the boiling method along with a small amount of syrup and stored for about 9 months in a cool, dark place. Hi all! I'm Cameron (aka Pastry Ninja) and I'm here to share delicious food with a sweet, sweet glaze of knowledge! Maybe toss in a few Karate forms here and there for good measure... Click on the pic for more info! Thanks for reading! Pastry Ninja Photography. Watermark theme. Powered by Blogger.